The Blackpool Gazette did a poll that hints that majority of Blackpool fans would boycott the crucial League Two playoff final against Exeter City. Almost 3,800 voters participated in the poll, mostly claiming they would sit out the game. Sixty eight percent say they would miss the game, twenty four percent said they would attend regardless of the situation with the rest undecided. Blackpool are set to play Exeter at Wembley on Sunday for a chance to return to the League One. Seven years ago 35,000 fans were cheering Pool to victory but this time the situation is hugely different. Ian Holloway led the team to victory over Cardiff City as they earned promotion to the Premier League for the very first time. In 2012, 30,000 fans were on ground as the team lost to West Ham United. Since then their troubles have risen as they plummeted through different divisions. This time majority of the fans are backing out in protest against the owners of the club the Oyston family. Exeter City claims 10,000 tickets have been bought ahead of the fixture – this could give them an advantage in the stands over the opponents. Pool boycotters have a big decision to make ahead of the final as the club would receive their share of gate receipts from the final. The fans have continually boycotted home games. The attendances last year were the lowest for a decade. 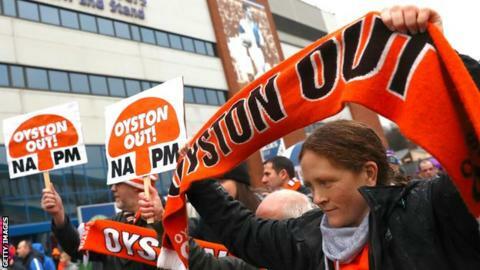 The passionate and united fans just want the Oystons to leave the club, until then the situation would not improve.